Very Slow Roller Coaster: This Kansas-based infringement lawsuit was filed back in 2006. The case was stayed pending an inter partes reexamination. Once re-opened, the district court held that ScriptPro’s asserted claims invalid for lack of written description under 35 U.S.C. § 112, ¶ 1. In a 2014 appeal of that decision, the Federal Circuit reversed – finding genuine issues of material fact regarding whether a skilled artisan deem the patentee in possession of the invention upon reading the specification. On remand, the district court again held the claims invalid on written description grounds and citing the oft maligned ‘essential element’ cases of Gentry Gallery, Inc. v. Berkline Corp., 134 F.3d 1473 (Fed. Cir. 1988) and ICU Medical, Inc. v. Alaris Medical Systems, Inc., 558 F.3d 1368 (Fed. Cir. 2009). On appeal, the Federal Circuit has now reversed again and remanded for trial. The claim at issue is directed to a conveyor and “automatic” collating system for prescription containers. U.S. Patent No. 6,910,601, Claim 8. The claim itself does not specify how the collation occurs, but throughout the specification the patentee indicates that the containers will be collated by patient name and storage space availability. Seeing that distinction, the district court agreed with the challenger that the claims fail because they were not commensurate with the written description of the invention. [O]ne of [the invention’s] central purposes is to collate and store prescriptions by patient. But the claims do not limit the ways in which the prescription containers are stored. They do not specify any type of collation or storage. . . . These broad claims are not supported by the much-more-limited specification. They do not require that the control system organize containers based on patient name and space availability. During its appeal, ScriptPro repeatedly emphasized a central purpose of the ′601 patent: to “keep [ ] track of slot use by particular customers and slot availability.” [quoting Federal Circuit decision] This means that the use of any other method for automatic storage is outside this purpose. Based on the broad claim language that is outside a central purpose of the patent, the court determines that no reasonable jury could find the written-description requirement met. . . . ScriptPro argues, keeping track of slot use by particular customers and slot availability is only one of several goals. But ScriptPro does not identify any alternate goals. The court finds ScriptPro’s argument unpersuasive. While every claim need not encompass every goal, here the claims do not address one of the invention’s central goals—one that ScriptPro repeatedly emphasized on appeal. It is disingenuous for ScriptPro to now downplay the significance of the goal. Without including a limitation to address the storage by patient name, the claims are simply too broad to be valid. On appeal, the Federal Circuit has reversed – holding that the patentee included a sufficient number of wobbly-words to avoid limiting the specification. It is true, as Innovation argues, that much of the ’601 patent’s specification focuses on embodiments employing a sorting and storage scheme based on patient-identifying information. See, e.g., ’601 patent, 4:21–25 (“[t]he unit stores prescription containers according to a storage algorithm that is dependent on a patient name for whom a container is intended”), 5:40–47 (“a prescription for a patient is entered into the control system of the ADS along with identifying information for the prescription, such as the patient name . . . [t]he control system next determines in which holding area to store the container”), 6:36–37 (“[t]he collating unit is also operable to associate a stored container with a patient based on the patient’s name”). 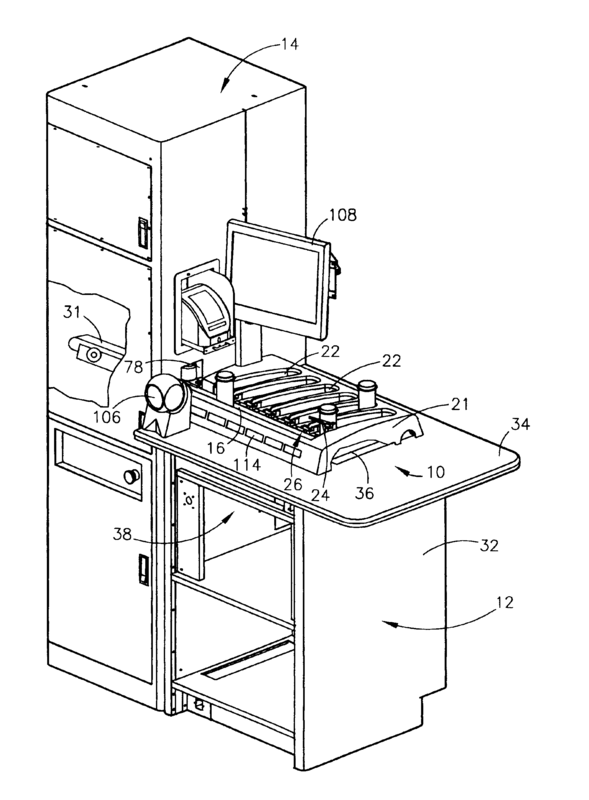 And it is also true that the specification explains that prior art automated control centers that store containers “based on a prescription number associated with the container, as opposed to storing the container based on a patient name” are “especially inconvenient for several reasons.” ’601 patent, 3:6–11. But a specification’s focus on one particular embodiment or purpose cannot limit the described invention where that specification expressly contemplates other embodiments or purposes. An amazing aspect of this case is that the distinguishing feature for written description is the focus on whether a patient’s name is being used to sort bottles (vs some number). On remand, the defendant’s next round involve Alice. Further, without reciting the particular structure, materials or steps that accomplish the function or achieve the result, all means or methods of resolving the problem may be encompassed by the claim. Ariad Pharmaceuticals., Inc. v. Eli Lilly & Co., 598 F.3d 1336, 1353, 94 USPQ2d 1161, 1173 (Fed. Cir. 2010) (en banc). See also Datamize LLC v. Plumtree Software Inc., 75 USPQ2d 1801 (Fed. Cir. 2005) where a claim directed to a software based system for creating a customized computer interface screen recited that the screen be “aesthetically pleasing,” which is an intended result and does not provide a clear cut indication of scope because it imposed no structural limits on the screen. Unlimited functional claim limitations that extend to all means or methods of resolving a problem may not be adequately supported by the written description or may not be commensurate in scope with the enabling disclosure, both of which are required by 35 U.S.C. 112(a) and pre-AIA 35 U.S.C. 112, first paragraph. In re Hyatt, 708 F.2d 712, 714, 218 USPQ 195, 197 (Fed. Cir. 1983); Ariad, 598 F.3d at 1340, 94 USPQ2d at 1167. For instance, a single means claim covering every conceivable means for achieving the stated result was held to be invalid under 35 U.S.C. 112, first paragraph because the court recognized that the specification, which disclosed only those means known to the inventor, was not commensurate in scope with the claim. Try to do more than just cut-n-paste some MPEP section and show that you can actually employ critical thinking to the actual points presented here. Remember, we are talking about the case where the applicant has indeed provided enablement. My Comment at #10 below, and the comments it elicited, prompts another foray. Litigators and judges play an eternal game of cat and mouse. Drafters are told by the litigators how to draft, which in turn prompts the judges to change the Rules of the Game, and so the rules of good drafting then have to change to reflect the changed Rules. For example, that section of the specification that used to be sub-titled “Summary of the Invention” is now just the “Summary” (of what, we are not told) and every instance of the word “invention” is purged from the specification. Currently, we are seeing increased emphasis on the requirement for “possession” and a “written description”, in order to nudge drafting back towards what makes sense. In #10, I allude to the EPO emphasis on the “undisclosed intermediate generalisation”. Its counterpart in the USA is the beefed-up WD requirement. My point is “A rose by any other name” and that it’s a small world, getting smaller all the time. I thought it was a long winded way to place Disney on the same plane with Shakespeare. I guess beauty is in the eye of the beholder. An astonishing number of comments in this thread have to do with the different but complementary roles of the “enablement” and “written description” requirements. There seems to be much unnecessary confusion. An example might help. Applicant files, summarises the invention as “fruit” and claims fruit. Enables with a Worked Example, an orange. But PTO cites an apple. So Applicant narrows to “core-free fruit”, (or “segmented fruit” or “citrus fruit”. Fails on WD because the application as filed is devoid of any announcement that invention lies in core-less (or segmented, or citrus) fruit. The worked example of the orange enables all of the claims, but at the filing date the inventor had not nailed the concept of core-less or segmented or citrus fruit. As the FtF regime of the AIA starts to bite, the difference will assume ever-greater significance. Your “word” example assumes the “answer” you think that you want. You SAY that the worked example of an orange is enabled. How then does THAT happen without the possession of said orange? All that you have done, MaxDrei, is, well, nothing. Nothing? Well I enabled other readers to comment, and thereby reveal whether or not they understand the different concepts of WD and enablement. Yes, by the way. The application as filed does enable the claimed subject matter. Nevertheless, the application as filed fails to demonstrate possession of the claimed subject matter, at the intermediate level of generality set forth in the amended claim. Were you really aiming for that? I’m guessing that sort of obfuscation cuts the mustard in 2XXX art units, but not 36XX, eh? Sorry Ben, I recognize the attempt at humor (or is it ad hominem), but do not recognize what point you are attempting to make. At 7.1.2.1.1.1 anon flatly refuses to explain why it is a given that an inventor has enabled their invention. However, it’s worth it to develop this argument as it looks like it is the crux of anon’s and Les’s confusion with regards to the distinction between enablement and written description. anon, when an examiner gives a 102 rejection, should they give an enablement rejection as well, because the invention was clearly enabled BEFORE the application? Do the typical Wands factors apply to this special 102-enablement rejection? Try reading the explanations given in several places. Give me the post number of one such explanation. Take your pick – all the posts are still here. Read slowly if you must. “There is a bit of the “Aried-logic flaw” in play by Les. That does not explain why it is a given that the inventor enabled the invention. The ONE who enabled something…..
And any confusion is NOT belonging to me. Continuing to refuse to explain means you are at least partially at fault. I DID explain – you were not listening. Your own example of a 102 rejection is the tripe that you tried to pull below. It’s not an example. It’s a question posed to try to deduce your position. However, you clearly have no interest in advancing the conversation. You’re a lowlife. You used a strawman to “deduce my position”….? And you call ME a lowlife…? LOL – stop taking Malcolm’s memes. It was a question. Not a strawman. You could have said “no, of course not” and then explain how the “inventor” enabled that which was ALREADY enabled. This case is only remarkable because of the district court’s apparent lack of understanding of basic civil procedure and patent law. This is the second appeal and reversal in a case that should have gone to trial or settle a long time ago. (It was filed in 2006). While enablement is an important issue in this case, the district court erroneously granted summary judgment invalidating the claims and the CAFC reversed that decision in the first appeal because there exist triable issues of fact as to the description’s meaning to a person of ordinary skill in the art. Upon remand, the district court apparently confused the written description with “invention,” and decided that the claims were invalid because they were broader than the embodiments. This non-existent ground for invalidity was properly reversed by the CAFC in the second appeal, so that the issues of enablement, obviousness, etc. can proceed to trial or settlement (unless the district court grants another ill-advised motion during this remand. Indeed. However, “confus[ing] the written description with ‘invention,’ and decided that the claims were invalid because they were broader than the embodiments” is directly attributable to some of the Fed. Cir.’s own panel decisions, primarily by the dissenters in In re Phillips, cited by the D.C.
P.S. Unnecessary D.C. and appellate legal fees fiascoes for clients, as in this old case, should be avoidable for newer cases where IPR or CBM alternatives are available. Nonexistent, but with historical precedent. Lizardtech taught A*sub*specific but claimed A*sub*broad, and was shot down by CAFC. No, I am not. And I believe that was clear when I said your description of enablement was fine. You appear to be desperately avoiding Ariad. There is a bit of the “Aried-logic flaw” in play by Les. How can one have enabled something that one does not possess? I think it’s possible because the term “possess” in this context is a legal term. It means that you have a fixed and permanent idea of what you’ve claimed, and you’ve evidenced that in your specification. “Select a drug from the group consisting of X and Y and administer it to treat your headache” is an enabled method claim. Anybody can select drug X and administer it! But if all you have in your spec is a disclosure of 1000 different drugs that “might work” to treat a cold and 1000 sentences describing administering each of them (including X and Y), then you don’t “possess” the invention, at least not at the time of filing. That’s one answer to your question. The “legal term” answer does not hold what you think that it holds, Malcolm. For example: product by process claims. Also, it is black letter law that for a group, not all embodiments have to work…. Also – and one of my pet peeves – ALL Pharma patents do not know or “possess” their utility at time of filing, because they are ALL filed prior to proving out efficacy with the FDA. Hey, you want your way? The ENTIRE Pharma industry is going to be a little peeved. Additionally, multiplicity alone does not negate possession (your very example is flawed because your specification shows the exact same possession in both cases with the only difference being one of number of items that you possessed). I can be pre-enabled by the state of the art regardless of whether the inventor enabled the invention. That’s nice – but that’s not what we are talking about. not to possess the very thing that she has enabled. Uh, why is that a given? Because it is – I have noted this below, and the comment above also indicates this. That’s a cop out. Just FYI. No cop out – and no confusion (on my part). Try reading the posts Ben – I was the first to point out the Ariad-logic fault and I explicitly noted that it was the applicant that provided the enablement. You might want to try explaining yourself for once in your life. Your online discussions, and I daresay your practice, might improve. LOL – asked and answered – thanks (and my practice is wonderful, but thank you eve so much for your concern). You’ve mentioned this twice below. It would be easier to keep the replies in one place. Why is it a given that the applicant has enabled the invention? Lol – amswered in several places. You asserted it in several places. I am not surprised that you might confuse asserting and explaining. Can you point me to the post # where you explained why it is a given that the applicant has enabled the invention? Maybe it got caught in the filter. Or maybe you could just provide the explanation. Falsehood. Give me the post #. As I said: take your pick, all of the posts are still here. Well, if you are not saying that, then you agree with me that if something is enabled, it is described. As anon observed, how can one enable something that isn’t adequately described? Still desperately avoiding Ariad, huh? They explicitly said that enabled scope could be undescribed. I don’t think he is “desparately avoiding” it as he is merely playing on the fault in logic that remains in that decision. You keep on saying something that is not happening, while it is you that is avoiding confronting that fault in logic. The point here being that you have agreed that the item has been enabled. The question remains: how do you find enablement without possession? (This might be related to the part of the quote of rising and falling together – something that does not always happen, but on the other hand, something that can (and does) happen. Because what one of ordinary skill in the art can make and use without undue experimentation can cause a claim to be enabled, even if there is nothing useful in the disclosure. If its enabled, then clearly the disclosure included everything that was needed and the thing is sufficiently described. A five year old claims “A rocket!” The claim is obviously enabled. Does one of ordinary skill in the art conclude that the applicant was in possession of the invention? I’ll bet that anon thinks the kid with the swing set patents enabled swingsets! I feel bad for his customers as he clearly puts his ideology above common sense or the law. Nothing of the sort Ben – sorry that you are having a difficult time facing the problem that I have pointed out. You still have not dealt with the fault in logic. Are you “desparately avoiding” correcting that fault in logic? You have not shown any faulty logic. Disclosure claims genus which does X. Applicant describes species A which does X. The field of art enabled species B. Thus, species B is enabled but not described by the applicant. It is a given here that applicant has enabled – move the goal posts back please. The attempt to use a strawman example of something obviously not novel and wanting the enablement to not be in the application is meaningless as I have already pointed out that applicants do not need to include such things. Please stop avoiding the logic issue so desparately. Ben, you will never get the likes of Les, Anon or people of their ilk to understand. To them, like Selden of old, one can disclose one kind of gas engine for a car, and claim every auto that uses gas engines of any kind. Their reasoning is this: the claim reads on the specification, therefor it is both enabled and described. Feel free to actually join the conversation Ned and answer the point that I have presented. Drive by ad hominem like your post here, though – not so much, eh? Ben in several places, MaxDrei in several places and to a lesser extent, Random, 6 and Ned all seem to run silent in the face of the points presented. The common denominator is easy to see. That is exactly what a claim is, a statement that the inventor invented the claimed thing. …or at least things she invented it. …or at least thinks she invented it. The problem is when applicant claims “A compound which does X”, and ONLY discusses the methyl compound. The ethyl and butyl compounds are enabled to one of ordinary skill in the art, but the applicant has not shown possession of those compounds by claiming the genus and only disclosing one species. Sure he has. The applicant has made a claim broader than X because he understands that compounds other than the preferred methyl compound also do X. If the applicant didn’t contemplate other compounds doing X, then why did the applicant claim it that way? A genus claim is evidence of “some other” species, but no particular species. There is no evidence for one of ordinary skill in the art to conclude that applicant had possession over any other specific species in that scope. I understand that you wish you didn’t have to show possession, but Ariad and Lizardtech both say you are wrong. Sorry. The patent system is better off with inventors having to describe everything they want to claim. Ben – that’s w cop out and q strawman since he is not saying that he does not have to show possession. The argument instead is what qualifies as possession. Now, my little presentation of the “Ariad-logic problem” is but one mode of that defining of having possession (and certainly not the only mode), but nonetheless, there really ARE times when both rise and fall together. He is saying claiming “other compounds” is good enough for showing possession of “ethyl, butyl compounds,” because you can’t claim the scope of those compounds without having possession. That is no strawman. And that is wrong. It is wrong under both Ariad and Lizardtech. And it is wrong because it does not promote the useful arts to let people claim what they haven’t described. I wonder why we bother having conversations. After all, it’s nothing more than previously-enabled words and sentences. Do you think its because we haven’t expressed particular embodiments of the enabled acts? The reason we talk is because we lack possession of all of our enabled embodiments. Most people aren’t buying books to learn new words. They’re buying books because the words they know are configured in a manner never described to them before. Usually through improper inductive reasoning, as is the case here. You shouldn’t be asking us, but your clients. Just because you don’t think written description exists doesn’t mean that cases like Ariad (where enablement existed but description did not) aren’t binding precedent. You assume the point to be proven. Once again – it is NOT that written description does not exist. You are not grasping the point here Random. This is not about Ariad being controlling law or not, this is plainly the fact that no one has shown how something that the applicant has enabled can somehow not be possessed. Lots of goalpost moving, strawmen and evading the logic-fault, but nothing yet on point from those claiming non-possession. So you’re saying that the WD requirement exists distinctly from enablement, but is necessary satisfied when the enablement requirement is met? I am asking someone to show how when the applicant has enabled something, how it could be that she does not possess that which she enabled. And I’m asking you to follow that logic through. If everything enabled is per se disclosed, how is written description distinct from enablement? I asked first – can you answer? OT, but the obviousness of ClearPlay’s junky “multimedia content navigation object” claim was affirmed today, Rule 36. If this had gone the other way (and that seemed like a possibility based on the oral argument) we’d likely be looking at a really shoddy 103 opinion that should have been a 101 decision (instead of a 112 decision that should have been a 101 decision). Bullet dodged. and the plurality of guide arms. There is a lot of effort by people here to read novelty into the claim from the specification. Why bother? There is nothing new here, at least not in the claim. Ned, that could give this case three more appeal and remand opportunities to add to the present two: An “Alice” S.J., a 103 S.J. based on longstanding Fed Ex or PTO package sorting machines [they also auto-sort packages that contain drugs], and maybe a 112(f) by treating “collating unit conveyor” as a non-structural functional statement of an end result? That could break S. J. Telesca’s prior record number of Fed. Cir. reversals before ever getting to a trial in Xerox v. Palm. I am almost provoked enough to go look at the prosecution history. How in the world this claim was allowed is a puzzle. That’s right, any possible novelty had to do with interpreting particular signals from particular sensors, and in two consecutive decisions the federal circuit has read those features out of the claim language. Random, assuming you are correct that the novelty, if any, is in the sensors and what they sense, none of that is in the claim. The claim claims structure. That structure is physical and should be shown in the drawings. How the structure is operated, is not pertinent to the claims. Now if the structure is old, as you suggest the invention is really in the sensor system/control system, that should be claimed as a method. But trying to mix the two claim forms into one can only cause enormous confusion, which is apparently the case here. I think part of problem here is that the attorneys involved in this case are confusing everybody including the judge and perhaps the Federal Circuit. There certainly is a lot of talk about this and that of the specification, and all of that talk is beyond the scope of the claims as none of what is being discussed here is in the claims. All this really does not help anybody. none of that is in the claim. Only once you construe the control system outside of means-plus, which for some reason the patentee inexplicably argued for. He’s going to tank his entire claim trying to reach this infringer. In IP Reexamination 95/000,292, the examiner stated that the prior art relied upon by the examiner did not demonstrate “a frame substantially surrounding and covering the infeed conveyor and the collating unit conveyor; a plurality of holding areas formed within the frame for holding that the containers – with the portion “formed within the frame” being emphasized emphasized by the examiner. The examiner went on to say: assuming, arguendo that a frame is added to the device of Lasher (as noted above), it would not have been obvious to modify the device of Lasher so that the plurality of holding areas are formed within the frame, due to the location and position of the holding areas in Lasher (e.g., it would render the device of Lasher inoperable to reposition the holding areas so that they were formed within the overlying frame). The examiner substantially repeats this reasoning and with respect to the other other references. Based upon this, there appears to be no novelty in the claim other than this frame structure and its location. All this discussion of the Federal Circuit about written description support for other limitations that are not even in the claims is really confusing everybody and for no good purpose. The claims have been allowed was because claim 1 recites a collating unit to store prescription having a storage unit to store the containers delivered by an in feed conveyor. There are plural holding areas. There is a plurality of guide arms to maneuver the containers from the in feed conveyor into the plurality of holding areas. There is a control system to control the operation of the conveyor and the guide arms. The selected holding area is dependent on whether previous containers have been stored in the collating unit and not yet retrieved … Claim 8 also recites the matter of claim 1 along with a collating unit conveyor and a frame surrounding and covering the in feed conveyor and the collating unit. . Claim 13 the matter of claim 8 along with a plurality of sensors positioned on the frame. Note that claim 8 does not have the limitation regarding selection of the holding area depending upon whether the previous containers have been stored in a collating unit and not yet retrieved. However, that appears to be the point of novelty, if I read the examiner correctly. Yet it is not in claim 8 as the examiner stated. Obviously, the examiner made a mistake, if not an error in judgment. Common sense is not available to this patent system until KSR is enforced. The irony here is impressive. iit The “patient name” vs “some number” issue should consider whether the prior art used the number as a proxy for the patient or whether a patient could have several numbers that are randomly assigned. There is no reason that “the prior art” in this instance should be limited to “patients.” We’re talking about information processing and logic at a very basic level. Common sense tells every lawyer who wasn’t born yesterday that “sorting” can be accomplished through the use of symbols (which are just a form of information) that are meaningfully related to the patient (e.g., “an F indicates a patient with flatulence”, or “a A indicates a patient with allergies”) or symbols that are “randomly assigned” to the targets of the objects of the sort. There are no claims — NONE — belonging to this infinitely huge genus of cr@p “innovations” (and there are infinite examples of it, with some more broadly applicable than others) that belong in a sane patent system. That’s why we have Mayo and Alice. It’s absurd for the CAFC to dance around the written description issue without pointing these glaring failures out to the parties (to their credit, some CAFC panel members do “sua sponte” remark on 101 problems during oral argument). I’m just baffled that this particular written description kerfuffle managed to get up to the Federal Circuit twice. What are the attorneys for the defense thinking? “born yesterday” – here we go again! a control system for controlling operation of the infeed conveyor, the collating unit conveyor, and the plurality of guide arms. Does anyone honestly think that two conveyors and a guide arm to move containers into holding areas is patentable? Of course it isn’t. What made the system patentable? The computer based control system. The algorithm the computer ran to actually automate the machinery which approximates an intelligent person putting mail into a grid of mailboxes. If you take out the control system the claim reads on any conveyor that drops items into a wedge-shaped surface, because you’ve just taken the “intelligence” out of the intelligent sorting. As I said before, that system was undescribed even when the claim was being construed as being limited to the intelligent sorting. So what does the federal circuit do? It confuses claim construction with written description. The court goes to a lot of trouble to determine that the claims aren’t limiting the control mechanism, but then forgets to actually answer the question of whether the applicant was in possession of all control systems, which is what they view as the proper scope of the claims in view of the specification. They take a system that had an undescribed species, state the proper scope is a claim to an entire genus, and then doesn’t bother to point out that the genus is most definitely undescribed for at least the reason it contains the undescribed species. In other words, we’ve got purely functional claiming right at the point of novelty, without even a single described species. Does the specification enable or prove inventor possession of sorting and storing “by patient, prescription, or any other predetermined storage scheme“? Of course it doesn’t, because it can’t, because you’re just construed it as being directed to an entire undescribed field. On remand, the defendant’s next round involve Alice. Ya think? No kidding. To those of you who dislike Alice – this case, just like the previous power grid monitoring one, are why you can’t have nice things. In fact, the ’601 patent expressly states that containers can be sorted and stored “by patient, prescription, or other predetermined storage scheme without input or handling by the operator.” ’601 patent, 8:21–24 (emphasis added). Throw in two conveyors and you’re golden. This leaves me wondering whether there is a yet another fundamental difference between the way cases are adjudicated in English common law jurisdictions (like the federal Courts of the USA) and the way they are in civil law (Roman) courts like at the EPO. I am alluding to the importance of the Doctrine of Binding Precedent. Thus, at the EPO, where there is no Binding Precedent, a Technical Board of Appeal feels the highest imperative is to get to the “right” outcome, as between patent owner and petitioner for revocation. Otherwise at the Federal Circuit, where the highest imperative is to hand down a clear Rule of Law (here in Connection with WD), that will apply universally, regardless where that leaves the parties, in the particular case in suit. Once again MaxDrei ploys his drek. Except those two aren’t inconsistent. The court not only could have but should have decided the issue put before them – Is WD met? The court essentially said that the specification allows for an interpretation that the sorting algorithm was not limited to patient-based sorting. Fine, but complete your analysis – Did the patentee prove possession of all sorting algorithms? It doesn’t require a lot of thought, because the patentability of the claim is premised on the idea that the sorting algorithm is the novelty. If a computer-based sorting algorithm was novel, then the specification itself has to be the thing that describes the full scope of the claim. Does the specification describe all sorting algorithms? Of course it doesn’t. WD failure. But because even that little bit of thinking is too difficult for them, they’re going to have to take the baby steps of having it analogized to them like children: This invention is like a mailman’s brain. We have a grid of mailboxes that preexist. We have a computerized “arm” which preexists (“a plurality of guide arms”). We have a computerized “leg” and “mailbag” (the two conveyors) which puts the packages into a delivery position. All we are doing now is moving the package sorting step from the mailman’s brain to the computer, i.e. we’re applying information processing on a computer. It’s a DDR Holdings case with no difficulty in the analog-to-digital conversion because the claim scope itself isn’t limited to a particular manner of performing the conversion – it embraces all control mechanisms. WD exists because the federal circuit spent about five decades getting the 101/112b dichotomy wrong. When the FC misapplies WD its just going to be invalid under either 101 or 112b (a proper Nautilus/Wabash 112b analysis) anyway. We don’t need to worry about them misapplying 112b, because they’ve now construed the claim in a manner that takes 112b off the table by making the claim directed to “any sorting algorithm whatsoever”, a straight 101 issue. That’s very helpful thanks Random. I like it when my posts draw out intelligent and informative answers. Don’t strain your shoulder patting yourself on the back – your question is NOT what prompted the additional answers from Random. 3.1.2.1.1 exists merely to be unpleasant- it carries no meaning or use beyond that function. You are off by one “.1” – in both directions. Throwing CRP at a wall to see what sticks smells every bit as bad as just throwing CRP at a wall. Best mode : “sort” or IMHO simply store and record location BY name. Other modes: record location by some other identifier. Which is it? Is the invention so trivial and obvious as to not be worthy of a patent or so complicated that every last line of micro-code has to be presented and explained? Are you not aware that Written Description and Enablement are distinct requirements? Thats not really an answer. For all I know, you could be some Ariad denier. At 3.1.2.2 you said “Ones of ordinary skill in the art could arrive at workable sorting algorithms without undue experimentation”, and concluded that there was a sufficient written description. But the test you mentioned (without undue experimentation) is the test for Enablement, which is distinct from Written Description. So, are you not aware that Written Description and Enablement are distinct requirements? ‘Cause from where I’m sitting “without undue experimentation” is a higher hurdle. If you make it over that one, you’ve made it over the other. He’s asking if you understand that the patentee has to actually possess all of what he claims to have. It’s not sufficient that others can come up with something, the question is whether this inventor posited it. Man, I seriously cannot tell if you are serious. Your description of enablement was fine. But enablement != written description. I recommend you look up the 2010 Ariad en banc decision. Random – Are you saying that the drug dispenser guy didn’t have the invention because the patent doesn’t describe every sorting algorithm even conceived? Are you saying that 112a allows people to claim scope including algorithms they do not actually possess? How do you know he does not possess it? Applicants do not need to include anything known by PHOSITA. I have often remarked that the end effect of the Supreme Court super empowering PHOSITA in KSR has a direct link with what needs to be in an application. I’m saying the drug guy may have had an invention – he could have described how sensor information was used to sort bottles. I’m saying the generalized statement that sensors can be used to sort bottles (absent a particular sensor/sorting setup) is abstract rather than concrete and fails 101. I’m saying that a claim to all sorting algorithms when he has only disclosed one is a failure of written description under 112. The only invention he could have had he didn’t claim. Applicants do not need to include anything known by PHOSITA. If the art already knew how to use a computer to control the sorting of conveyor belt items, what is the theory of novelty/non-obviousness here? Are you saying that applying it to prescriptions renders it non-obvious? because the patent doesn’t describe every sorting algorithm even conceived? BTW, nobody makes you claim a super broad scope. If your claim would make every sorting algorithm conceivable an infringing embodiment, then you have to prove possession of every conceivable sorting algorithm. How about a claim that “makes every screw an infringing embodiment“…? When the novelty of the claim is in a new screw, or even in the first screw, you can’t make every screw an infringing embodiment. That’s the point of promoting the progress. If you invent one screw and make all screws infringing, nobody has an incentive to disclose more advanced screws. Of course, you’re not talking about a novel screw, you’re talking about a claim which has known screws as a non-inventive feature. In that case, though the claim is drawn to “every screw” it does not make every screw an infringing embodiment – only those screws used in conjunction with the particularly-claimed inventive aspect. There is a huge difference between claiming “my particular novel thing” in conjunction with a whole host of old things (that’s why you can use a phrase like “comprising”) and claiming old things in conjunction with your particularly posited novel thing and also a host of other novel things which may or may not have been posited or disclosed. The difference goes to the very heart of the purpose of the patent clause. But then you knew that, didn’t you? Is the invention so trivial and obvious as to not be worthy of a patent or so complicated that every last line of micro-code has to be presented and explained? That’s kind of an odd question given that, as far as I can tell, no “code” whatsoever was disclosed by the patentee. But given that computerized machines can be used to sort stuff (an admittedly minimal description of what computerized machines can do), yes, a claim directed to the use of a computer to sort prescriptions (a sub-class of stuff) is laughably obvious. Also true of a zillion other “use a computerized machine to sort this thing” claims. Also true of a zillion other “use a computer designed to carry out logic to carry out logic and improve this machine” type claims. But we must have these junk claims! Otherwise nobody will know what to do with all these computers. Or so we are told. Just as (same logic) obvious as putting protons, neutrons and electrons together (no matter what the final configuration). Again (for low functioning or naive people who haven’t heard this before): in the grown-up arts, b0ttom feeders aren’t getting enforceable claims to “old stuff with a new proton stuck on it” just by writing the claim. That’s been the case for many years. It’s kind of a huge and important distinction but I understand that it seems s00per d00per nuanced to you. Try to recognize that you’re pretty much the only person out there who doesn’t get it. Have you noticed that the only people who make anything resembling your pi ti fully ign0rant “argument” are the world’s biggest patent l 0sers? I have. I’ve been pointing it out to you every month when the oral arguments come around, followed by Rule 36 smackdowns. Tell your friends (if you have any)! Maybe they can help you out. You mean like the latest thread from Prof. Crouch (Pharma)…? Transmutation in this context is conversion of one chemical element into another. A transmutation entails a change in the structure of atomic nuclei and hence may be induced by a nuclear reaction, such as neutron capture, or occur spontaneously by radioactive decay, such as alpha decay and beta decay. So, at a minimum you CAN get a patent for taking something old and sticking a proton on it. I don’t understand why you think ALL sorting algorithms have to be described. Ones of ordinary skill in the art could arrive at workable sorting algorithms without undue experimentation. 1) You have absolutely no basis for assuming the latter statement. On the other hand, the nature of inductive reasoning suggests that the statement is not true. A species doesn’t solve a genus, because a genus routinely contains diverse species. 2) The premise of the invention is that one of skill *couldn’t* arrive at workable sorting algorithms without any help, or the sorting algorithm would have been obvious. If there was an enabled solution and a motivation for applying the solution (and Patentee admits there was a recognized problem) then the claim is obvious. 3) Written Description requires that the inventor actually invent the invention. You cannot put a fact or teaching out there and then claim all of the applications that one of skill could put the teachings to. The requirement is to show possession. The only possession the Patentee showed was a particular sorting process, not all sorting processes. 4) Beyond the 112 issue, when you say “I don’t understand why you think all Claimed X have to be described” you’re making the exact same (losing) argument that Morse made. He disclosed something, claimed his disclosure *enabled* applications he hadn’t thought of, and then tried to claim all of his unthought-of applications. How did that work out for him? The same logic the Supremes applied to Morse under 101 the Federal Circuit applies under 112a WD. There’s no way to have a valid scope to the full genus because you can’t claim a novel genus unless you prove your novel embodiment is indicative of the full breadth, which you can’t because you’re outright stating that there are distinct ways of achieving the sorting. 1) You have absolutely no basis for assuming the latter statement. On the other hand, the nature of inductive reasoning suggests that the statement is not true. Of course I have a basis. I am not even of ordinary skill in that art an I could arrive at a workable sorting algorithm, as could most motivated 4th graders. ABCDEFG comes to mind…. So if you claim every method for getting a result, you must show that you had every method for getting that result. And if I say the invention includes a microprocessor configured to maintain information on the location in which pill bottles were stored in association with the names of the pill for whom the pills were dispensed so that the location information can be retrieved based on the name of a person, does that not show that I have the invention? Does it know show that I understand that there are a lot of ways to do it (alphabetizing and storing according to the alphabetization, simply storing the information in association with the names and then performing a comparison of an entered name to the name of each record, etc..)? I think it does. I think it shows I have possession of the invention. Now…. If you have a new sorting algorithm that I didn’t disclose…. and you want to patent a system just like mine but wherein your new sorting algorithm is used, you are of course free to do that. Les, “microprocessor configured to do something.” This is not a claim for structure, but a claim for some action in the midst of structure. Now tell me, just what the f are you trying to claim, structure or process? You misunderstand (yet again) – software is not software being executed. Your “structure” argument would need to use the proper patent doctrine of inherency. Your lack of using the proper doctrine is noted (again). You are mistaken. A processor configured to maintain information on the location in which pill bottles were stored in association with the names of the pill for whom the pills were dispensed so that the location information can be retrieved based on the name of a person conveys structure to one of skill in the art. The USPTO agrees with me. I receive office actions fairly often on application that were filed before the recent flurry of Judicial Activism wherein the Office goes so far as to suggest that adding recitation of a configured processor will overcome any question of eligibility. Les, information is not structure. A process is not structure. A machine is structure. You can whine all day long that the PTO thinks this or that. They have long demonstrated that they are as confused as the Federal Circuit since at least as the surrender at the Alamo, or was that, Alappat. Software is not a story, or a poem. Software IS a manufacture created by the hand of man (and most typically for a proper patent eligible utility). Software IS a machine component. Software IS equivalent (in the patent sense) to hardware and to firmware. ps: that you seek to joke about Alappat says a lot more than you think it does. I said, “Information” is not structure. Your point is what exactly, Ned? A processor with different information is not a different processor. Similarly, an algorithm is not changed because of information. To the extent that this is not well understood and accepted by everybody, then we are going to continue to make a mess of patent law. A programmed computer is not a new computer because what is really going on is a method – a machine process, a new method or process of using an old machine. Trying to claim a process as a machine is a major problem. A processor differently configured IS a different processor. You seem lost again as to the proper patent doctrine to be using (the inherency doctrine). Of course, the reason why you just don’t go there is easy to see – you would have to go AGAINST the Morse case and try to hold that all future inventions are “already in there” for a blank processor. You really really really need to grasp that the execution of software is not software, and in the critical patent sense, software is equivalent to hardware and is equivalent to firmware. Time for you to be inte11ectually honest here. If one can patent the book with a different story one is not patenting books. Why are you attempting the canard of trying to use an example from the non-Useful Arts? You are wrong from the get-go. You are COMPLETELY missing the exception to the judicial doctrine of printed matter (Come man – I even explicated this for you in VERY easy to understand simple set theory terms). Everyone with even a rudimentary writing skill is capable of writing a fiction novel. Yet fiction novels continue to sell. Why do people buy books when they were capable of writing them themselves? Are there words or grammar in a Harry Potter novel that is beyond your ability? Because enablement is not the same thing as possession. There’s a difference between having the ability to write any fiction novel, versus actually writing it. You actually aren’t capable of thinking of *every* sorting algorithm, and you’re just uninformed if you think science and thought has said all there is to say about sorting. But even if you were capable of figuring it out without undue experimentation, the question is whether you posited each and every one of them. NO. One of skill can do it after reading and understanding the specification. That doesn’t mean it was obvious at the time of the invention. Almost all inventions are combinations of existing components. What is new and not obvious is the combination. One of skill can do it after reading and understanding the specification. That doesn’t mean it was obvious at the time of the invention. Except for much of the field the specification is entirely silent – there is no more knowledge in the field after reading the specification than before reading it. If I teach you how to build a car, it does not follow that you can build all motor vehicles, because there are motorcycles and boats, etc. If my specification doesn’t teach how to make a boat and a boat falls within the reach of my claim, either the boat was already known (which makes “motor vehicles” obvious regardless of the car teaching) or the boat is still unenabled and undescribed even after the car teaching. If you teach someone how to make a car, the proper claim scope is to a car. “Motor vehicles” is overbroad of the invention, either because it includes non-inventive embodiments or because it includes unenabled and undescribed embodiments. The only way you can teach a car and get a scope of “all motor vehicles” is to prove that all motor vehicles are entirely similar to cars, which is simply not the case. In this case the patentee is specifically arguing that the “car” is different from other “motor vehicles.” He’s estopped from arguing the one thing that would save his claim. If the specification discloses a vehicle including an engine for producing power, a drive shaft for delivering power to a final drive element and a transmission for linking the engine to the drive shaft at selected rotational ratios, focuses the detailed explanation on a preferred embodiment having 4 wheels, at least one of them being the drive element, and then claims the broader combination of engine, transmission and output shaft, that is perfectly disclosed and claimed. The breath of the claim makes it clear that other vehicles than the 4 wheeled variety were contemplated and “possessed”. Boats and planes are neither disclosed nor claimed. Others are free to patent those. However, if they include the claimed combination of elements, they need to get a license from the patent owner before they make, use, sell or import them or face infringement litigation, which they will lose. “Contemplation” isn’t enough. The contemplated scope has to have a similarity to what you have particularly described in your embodiments such that you can say the person possesses the full contemplated scope. Again, this issue was directly decided in Morse. Morse described his telegraph and then stated that he contemplated other ways of printing at a distance, and he didn’t get all manners of printing at a distance. if they include the claimed combination of elements, they need to get a license from the patent owner before they make, use, sell or import them or face infringement litigation, which they will lose. Hahaha way to assume the argument. Sure *if* the claim is valid they need a license. But as the Ariad or Lizardtech patentee will tell you, that claim isn’t always valid. If you describe an embodiment with particularity, but then you leave out relevant features in the claim (as what happened in Lizardtech) then your claim is going to be invalid as overbroad under 112a or b. If you describe an embodiment and summarily state that because you have that embodiment you’re entitled to everything else that performs the function, regardless of how different it is in working, you’re going to be invalid under 112a or 101. You’re welcome to argue this, but you’re wrong. These cases do exist, they have been found invalid, that is fact. It certainly does NOT work like that. and Boats and planes are neither disclosed nor claimed. Others are free to patent those. However, if they include the claimed combination of elements, they need to get a license from the patent owner before they make, use, sell or import them or face infringement litigation, which they will lose. there is no 112 issue and assuming it is new and not obvious, it reads on a boat and an airplane if they include the claimed combination. … even though I didn’t disclose those. ” Which is it? Is the invention so trivial and obvious as to not be worthy of a patent or so complicated that every last line of micro-code has to be presented and explained? It may be your point. Its also why your argument fails. You can’t have it both ways. You can’t argue its obvious and in the same breath argue that it wasn’t disclosed. You can’t have it both ways. You can’t argue its obvious and in the same breath argue that it wasn’t disclosed. Of course you can. Alternate theories of proof and law are entirely allowed, that’s first year law school stuff. When the specification is silent on something (or provides no useful teaching) one of two things is true – either the art could do it before reading the specificati2on, or the art couldn’t do it even after reading the specification. Suppose a specification states “The machine spins straw into gold by using its straw-into-gold module” and that is all it says. Either 1) the art couldn’t spin straw into gold, and the straw into gold module causes a 112 failure on any claim that claims it or 2) the art could spin straw into gold, in which case that feature is obvious. Now I can do a search to try and figure out whether a straw-into-gold module preexists or not (i.e. I can do extra work to try and figure out which particular statute the claim fails under), but it’s not relevant to the outcome of the claim – whether I find the reference or not, and whether you argue the reference or not, the claim is invalid. If I make a 103, and you argue the prior art doesn’t teach it, that plus the specification admits you have a 112 issue. If I make a 112 and you argue you don’t have to describe what the prior art knew, then you have admitted sufficient facts for a 103 – the art could do it (there may be a rare case where the art lacked motivation, but neither this hypothetical nor this case is it). Your “yes you can” goes both ways – which is just another way of saying that your own “pet” “predictable” squeeze does not work. Of course it does, but you have to satisfy both requirement simultaneously. We don’t give out patents for satisfying either 103 or 112, but both together. Pretty sure the law was written prior to that – and your own massive misunderstandings here just prime the entrance of 6 to take you behind the woodshed (yet again). And yet WD didn’t arise as a theory until around 2000 despite the law being written in 1952. It took the federal circuit till the 1970s to go completely off the rails with 112b. Then it took a while more for them to realize the problem with exactly the kind of logic Les is using now – logic that was refuted as far back as Morse. You look at Lizardtech and Abbvie and you see a court that is reinventing the Morse wheel using the exact same logic applied to that case just 100+ years later. As Les points out, WD isn’t an unambiguous application of the 1952 112a statute, which is why it took them so long to have WD emerge as a theory. WD is tortured reading of 112a to achieve the pre-existing 101/112b dichotomy because they were misapplying both 101 and 112b, yet logic dictated that the dichotomy had to be applied or you’d end up with ridiculous inductive scopes. Random, you yourself are off the rails. No problem – just reference any of the past multitude of explanations that I have provided when you choose to conflate 101/102/103/112, thereby showing that you really do not understand any of them. …or better yet, we can trot out 6 and make even him look good by schooling you. I’m not sure if you are a lawyer, but bragging that you have a non-lawyer examiner on your side is doing an argument to authority wrong. No wonder why you hate scoreboards so much, you can’t understand how to score points, hahaha. Both of your comments miss the mark – and badly so. First, the fact that I am NOT “appealing to authority,” but rather to 6 is on purpose and is a slap at your “mental prowess,” since not only is an authority not needed to deal with you, a typically p00r source is made to actually look good in comparison to your wack. Secondly, it is not “scoreboards” that I dislike, but broken scoreboards and the rather lack of critical thinking that occurs with broken scoreboards – the perfect example being you and your lack of even recognizing the issues of the scoreboard being broken. That I have to explain this to you AGAIN only shows how much you lack that ability of critical thinking. The office follows law, it doesn’t make it. To say that 6 disagrees with a lawyer is a commentary on the Office’s ability to teach, not the lawyer’s ability to reason. Its like saying the federal circuit disagrees with the supreme court. You’re free to call it a slap if you want, but just like the Supremes don’t care, and will just go on teaching their inferiors until they get it right. I’m not too worried on the issue – I don’t have to deal with the fallout of his actions. Which isn’t to say I’m a big deal either, I’m just better at figuring out what the Supremes will say than either you or 6 are. There is nothing wrong with the Supreme’s logic on anything. Your perceived lack of critical thinking on 101 ascribes a motive to Congress it obviously doesn’t have. How many years are going to go by with Congress doing nothing before you accept that when the Supreme’s say that judicial exceptions exist, they exist? Same with your perceived slight with ladders of abstraction and vague or functional claim terms. Nautilus heralds the outcome, we just lack an Alice-style homerun shot to really drive the message home. It’s a’comin. You REALLY are deep into the weeds. There is no lawyer here for 6 to disagree with – I have invited 6 to school you (IF you are claiming to be a lawyer – you need to sue your law school). LOL – thanks for making my case for me. Max, I think you have a point that the Federal Circuit at times seems more inclined to state general rules based on a particular case that bind future panels. Obviously this is backwards from the idea of the common law where particular cases are decided narrowly on the facts and broad prescriptions are considered dicta. Ned – tell me again (or for the first time) what is the difference between patent law (statutory law) and common law? This is why the administrative state works. Ten years after, the PTO procedure has produced zip point zero while the district court continues to get reversed. This is what makes Amurrrica great, if you’re a grifter representing a thief. The “patient name” vs “some number” issue should consider whether the prior art used the number as a proxy for the patient or whether a patient could have several numbers that are randomly assigned. Organizing physical things based upon an attribute of the things (vs merely information) should fall with eligible subject matter. In other words, if the underlying attribute is represented by information for purposes of implanting the process, then the subject matter could be subject matter eligible.